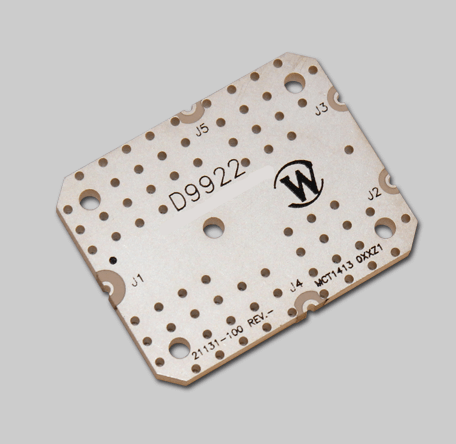 The Model D9922, rated at 200 W CW, is a surface mount 0° Combiner/Divider which provides very low loss across the entire 2-6 GHz bandwidth. Ideal for amplifier houses concentrating on modules only, the D9922 is robust and measures only 1.4 x 1.1 x 0.14". Buy the engine without having to buy the entire car! The Model D9922, rated at 200 W CW, is a surface mount 0° Combiner/Divider which provides very low loss across the entire 2-6 GHz bandwidth. Ideal for amplifier houses concentrating on modules only, the D9922 is robust and measures only 1.4 x 1.1 x 0.14″. Buy the engine without having to buy the entire car!